It’s very rare in the UK that we get perfect airshow weather, but on September 8th 2012, mother nature gave us a break. 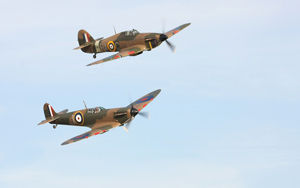 Thousands flocked to Duxford for the annual September show. 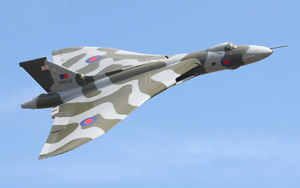 For the first time since 2008, Vulcan XH558 was returning to the airshow flying programme. Another classic jet in the shape of a Lockheed T-33 was also making a welcomed return to the UK. 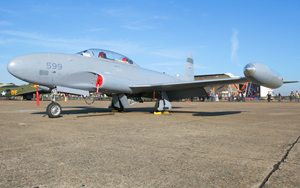 We have not seen a T-33 in the skies of Britain since the sad loss of Golden Apple Trusts G-TBRD in September 2006. 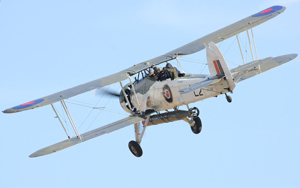 To complete the list of crowd pullers was the possible last flights of 2 amazing WW1 replicas. 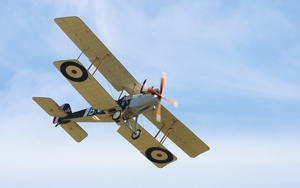 Royal Aircraft Factory RE.8 and Albatros D.Va were both built (to a very high standard) by New Zealand company ‘The Vintage Aviator Limited’ and will be placed on display at the RAF museum at Hendon very shortly. What a shame as they look stunning in the sky!! With the sun blazing, Duxford became very crowded early on Saturday morning. To me it looks as if the trade stalls are becoming less and less at the air shows. Still there was plenty to spend your cash on. For me, the return of a WW2 bomber command briefing was excellent. Based on a real raid and set in one of the original WW2 buildings, re-enactors acted out a detailed briefing plan. You couldn’t help but be sucked back to 1940’s Britain!! A nice touch, although a Fighter briefing would be even more apt given Duxford’s history. With my wallet relieved of a few hard earned quids, It was time to catch a few rays before the show started at 1.50pm. 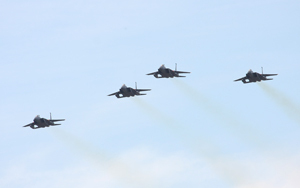 To open, the USAF sent 4 F-15c’s from Lakenheath. Although only a single pass, it was a great way to get the display started. 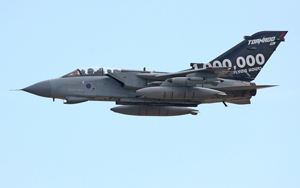 Continuing the fast jet theme were 2 RAF Tornado GR4’s from XV(R) Squadron based at Lossiemouth. With budgets the way they are, we are lucky to see any of the RAF’s assets displaying. The GR4 role demo has proved very popular this season. 2 Tornados simulate an airfield attack, showing the capabilities of the RAF’s strike force. 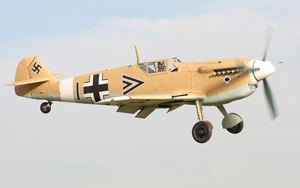 Normally this would also involve some spectacular pyrotechnics, but Duxford just doesn’t have the room, although there is a nice mound at the back of the airfield but I wont go into that one!! Again, the jets continued with the mighty tin triangle, Avro Vulcan XH558. Basqued in glorious sunshine, we at the M11 end were treated to a lovely topside pass. Martin Withers put on a nice display within Duxfords confines, Maybe not as dynamic as other displays, but altogether very enjoyable. 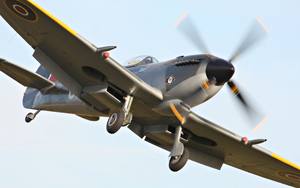 VTST are hoping to keep her in the air until the end of 2013 at least. With the Vulcan cleared the RAF’s basic fast jet trainer, the Tucano took to the sky. 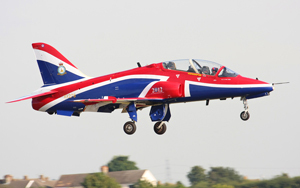 This year the aircraft has been painted in a scheme to celebrate the Queen’s Jubilee. Piloting the Tucano this year is 27 year old Jon Bond ‘Bondy’ Bondy did a great job of showing of why the RAF chose the Tucano as its trainer. 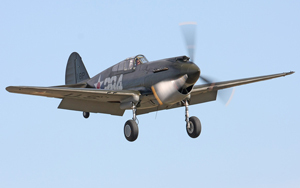 The first of the days Warbird participants was the Fighter Collections Pearl Harbor veteran, P40B Warhawk. The Allison V10 sounded brilliant as it climbed into some nice high loops. Two more TFC owned aircraft streaked across the airfield in formation next. 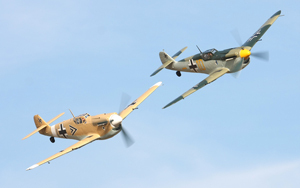 TF-51 ‘Miss Velma’ and P-47 Thunderbolt ‘Snafu’ performed a single pass before splitting for individual solo’s. 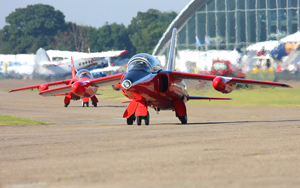 This is only the second display performed by ‘Snafu’ since its return to the air. 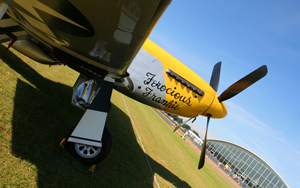 TF-51 ‘Miss Velma’ has been on the airshow circuit for a few years now and Nick Grey put in a spirited effort. 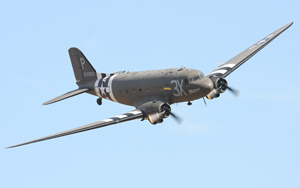 Dakota heritage ltd’s C47 Sky train ’Dragemoot’ is a genuine D-Day veteran. 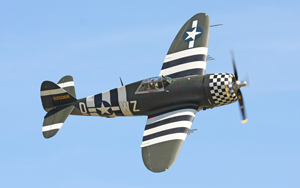 This was the first of the multi engined American WW2 aircraft to take to the skies on Saturday. It is unbelievable to think that this aircraft is so manoeuvrable. She was really put through her paces with some nice wing overs and tight turns. 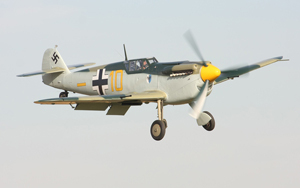 Its great to see her still flying with such a great history. An unusual formation of big biplanes flew next. The idea came from Mike Miller owner of Dragon Rapide G-AGJG. The RNHF Swordfish, D&M Miller’s DH Dragon Rapide and the AN-2 Clubs AN-2 did a nice slow formation pass before splitting, with the rapide and AN-2 landing and the swordfish going into its display. As always this was finished with the Ensign flag flying and saluting pass. 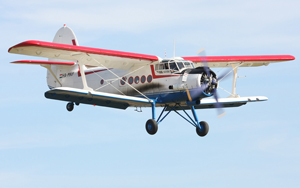 The AN-2 took off again to show the capabilities of this huge biplane. Anna Walker took us back to the 30’s with some exhilirating aerobatics in her Bucker Jungmann followed by Radial revelations T-28 Fennec. 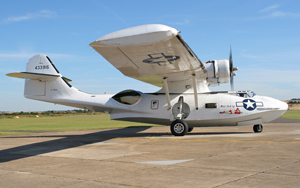 Plane Sailings PBY Catalina looked stunning against the blue sky as she flew gracefully above the airfield. 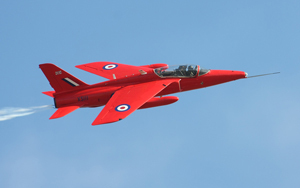 A pair of Folland Gnats followed the Cat. The much anticipated WW1 section didn’t disappoint. 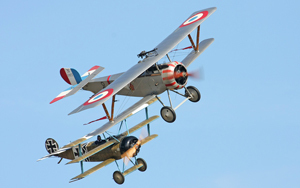 The RE.8 and Albatros D.Va were joined by airshow regulars Nieuport 17 and Fokker Drl. Dogfighting above Duxford, the aircraft swooped across the airfield with the triplane bellowing smoke as if being shot down. 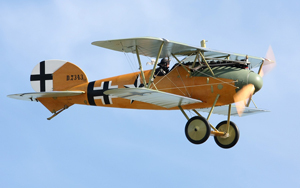 Aviation collector Kermit Weeks was over from the States flying the Albatros. I’m glad I saw the two biplanes before they are tucked away in Hendon’s museum. More American radials displayed with B-17 SallyB and TFC’s Bearcat. 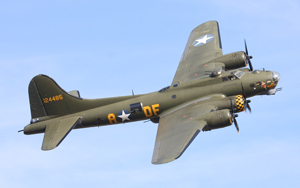 Sally B costs an unbelievable £80 a minute in fuel to fly!!! The RAF’s Hawk T.1 was also very enjoyable. 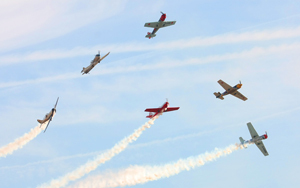 6 Yak 50’s of the Aero stars gave a nice aerobatic routine on the Saturday. I believe they were not down for the Sunday but the Red Arrows gave Sundays aerobatic display. For me the only let down of the day was the Lockheed T-33 from Norway’s Historical squadron having to pull out. 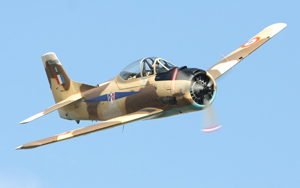 The aircraft was recently acquired and was still in Canadian colours (apart from the Norwegian airforce crest being applied for an event at North Weald). 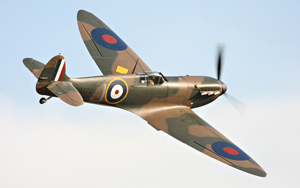 It is due to be painted in Norwegian Airforce markings for next year. 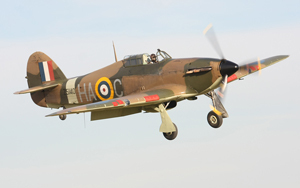 We did see it depart, but due to radio problems, headed straight to North Weald after takeoff. This left the finale. 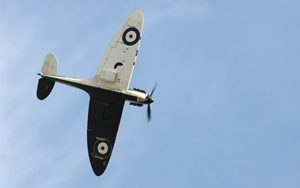 With the skies reminiscent of the Battle of Britain 2 Buchons, 4 Spitfires and a lone Hurricane took to the sky. I expected there to be a tail chase but instead we got some lovely formation passes with the 2 Buchons, followed by the MK1 Spitfire from ARC and their Hurricane, then the other 3 Spitfires.